Today we celebrate the feast of the Visitation of Our Lady to Saint Elizabeth which beings to a close the Marian month of May. 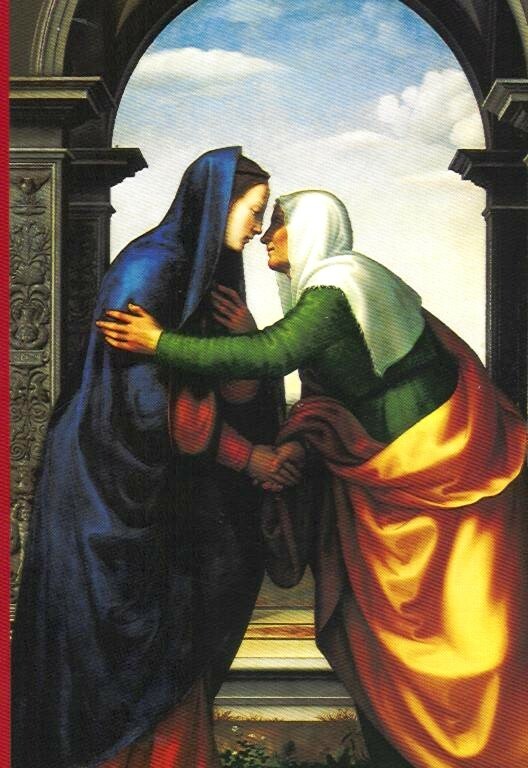 In today's Gospel, we see the image of two pregnant women meeting together in such a happy scene. One is an old woman already in the twilight of life, for all these years without fruit, who was suddenly blessed with child. One is a young woman, full of promise, whose life plans were abruptly dislodged by the perplexing news of an angel that she was to be with child even if she did not know man. Here we see the God of surprises truly at work. He visits us unexpectedly and we are indeed surprised, especially because he comes often when we least expect it: when we have given up on dreaming he paints dreams for us again, when we have dreams of our own that are so few and so little he pushes us forward to wider horizons we could not have dreamed of ourselves. Here is the God who raises up the lowly whom Our Lady sings of in her Magnificat. At the same time He also casts us from our thrones when we have become haughty, throwing us down by a rather unpleasant surprise that surely hurts and yet restores wholeness and truth. He lets even the richest person experience hunger and emptiness and at the same time allows even the most destitute some measure of joy and fullness. He always catches us by surprise, when we least expect, in ways we never before imagined. We are overwhelmed indeed. Are we sensitive to God's surprises? Do we welcome them in our lives? Or would we rather live comfortable amid the ruins of our rancid, ruined dreams or in the small, quaint huts we hide in? God of manifold surprises, visit us like you did Mary and Elizabeth. Then we shall also be able to visit our neighbor, even those living very far away from us, and sing to them your song. The Lord is Risen, alleluia!